Nintendo has decided to avoid the standard stage show for their E3 info drop, ever since the Wii U took to the stage in 2012, instead deciding to show a premade video called the Nintendo Spotlight. While significantly shorter than the shows of competing brands Nintendo's event had more surprises that mattered and kept delivering them quickly. 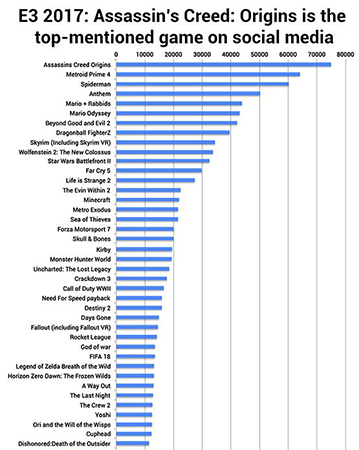 While Ubisoft's big new Assassin's Creed game walked away as the most mentioned game, Nintendo games made up a big number of the most talked about games. Metroid Prime 4, a game that showed nothing more than a screen with a title and some cool music, was the second most discussed game on social media. That's insane that a series that hasn't seen an entry in 10 years generated so much hype but it also proves that Nintendo knows the market better than we give them credit for. And while Metroid Prime 4 was one of my personal biggest sources of excitement that wasn't the only big game Nintendo had shown off. Closing out Nintendo's show we saw our next look at Super Mario Odyssey and its crazy new possession/capturing feature. In an interview with Andrew Collins from Nintendo of Canada, it's clear that Nintendo themselves are excited about the new game when I got the chance to ask Andrew what his favorite subject at E3 was he had this to say. "I just describe my job as 'I'm a bit like Father Christmas' because I get to give [everyone] the chance to play Mario. And I never take for granted the fact that everyone is so, so happy to play Mario and it's a pleasure to just watch people. The killer about it is that I always want to take the Joy-Con off myself and just show them how to do it... I am constantly fighting that with myself." Just hearing Andrew's passion about Mario shows that Nintendo is definitely trying something different with Mario this time around. 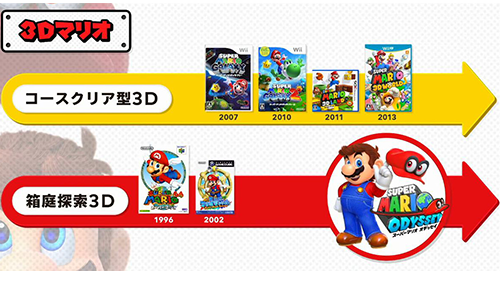 While definitely still a 3D Mario game, Super Mario Galaxy 1 & 2, Super Mario 3D Land & World, and the NEW Super Mario Bros collection of games all feel distinctly different from the open sandbox style of Super Mario 64 and Super Mario Sunshine. Those more open Mario games are what gamers have been clamoring for, myself included, and Super Mario Odyssey seems poised to scratch that itch. This is something directly acknowledged by Nintendo a few months back especially when you look at this photo right from the Big N.
Talking further with Andrew Collins, I was quickly reminded of Nintendo's latest gamble: Mario + Rabbids Kingdom Battle. A game that was clearly looked at with raised eyebrows actually surprised gamers with its very Un-Nintendo style gameplay. "It's a great kind of kid's game because it's got the cute cartoon characters of Mario, Luigi, and the Princess but it's done with the design style of Ubisoft's Rabbids Team. I don't think it's fair enough to just describe it as some sleeper hit, I saw it a couple of years ago and thought that "yeah, that's an interesting game' but then literally every person who wanted to play the Mario demo said right after that they want to play Rabbids. The people who play the game are really varied. We older gamers can imagine playing it with our kids!" Nintendo has finally seemed to strike a perfect balance between the games we know and want and the risks that are worth taking. Looking at Nintendo's E3 gave away a key piece of information: Nintendo is listening to gamers. While the Wii and Wii U eras showed off how Nintendo could easily give fans the cold shoulder, it's more important than ever that Nintendo shows us that they're listening. While competitors like Sony get flack for showing off games too early I think it's because we know that Sony understands and will inevitably deliver, Nintendo needs to win back our faith. And something as simple as showing off a title for Metroid Prime 4 or a truly 3D Mario proves to us that Nintendo really gets it. And that's a message we needed to hear. What did you think of Nintendo's show? Are you looking forward to Mario or Metroid? Share your comments below!